Learn how eBay evaluates your performance, protects its sellers, and helps you handle sticky selling situations. 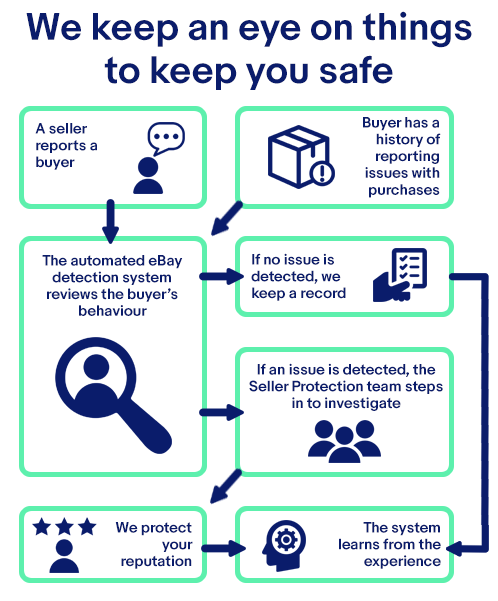 eBay seller protection includes detection systems, transaction monitoring, and policies that help keep eBay a great place to sell and a safe place to trade. We have a dedicated seller protection team that works behind the scenes around the clock to enforce our buying practices and seller protection policies. Backed by automated detection systems that monitor millions of transactions every day, our team keeps a lookout for anything that could cause problems for our sellers. While you may never have to deal directly with us, you can sell confidently knowing we’re always here for you. eBay has automatic detection methods to identify and block buyers who consistently violate buying policies, don’t pay for items, or show a pattern of leaving unwarranted negative feedback. The seller dashboard, Resolution Centre, and Unpaid Item Assistant can be used by sellers to monitor and resolve issues as they arise. If you feel a buyer may be violating one of our policies, you can report them. Review the buying practices policy to ensure it's really a violation. To help maintain a safe and fair marketplace, we hold sellers accountable to high standards of customer service. However, we also have policies and systems in place to help protect sellers and avoid penalizing them unfairly. Our seller protection policy explains the methods we use to evaluate your performance, and the safeguards in place to protect your seller rating and help you out in case you have a problem. For example, we’ll remove transaction defects and late shipments in situations where you weren’t at fault. Seller protection is also built in to our case resolution process. Protect your account. You should use the same techniques for protecting your eBay account as you would for any other online platform that stores personal information: Choose a unique password that's difficult for others to guess, monitor your account regularly for suspicious activity, and use online protection software to keep your account details secure. Keep transactions on eBay from start to finish. Keeping transactions on eBay not only ensures that you adhere to our policies, but it also helps protect you, and gives you access to our help if something goes wrong. We don't allow our members—buyers or sellers—to make offers to buy or sell outside of eBay, so if you receive an offer to from a buyer to complete your sale outside of eBay, please report it. It could be fraudulent and could put your information at risk. Recognize and report spoof (fake) emails. Spoof emails are emails that pose as messages sent from eBay to our members. They are used to attempt to obtain personal or account information and can pose a serious risk to the security of our members. Learn to recognize spoof emails, and report them if you receive one. Be aware of fake websites pretending to be eBay. Similar to spoof emails, some attempts to steal or "phish" personal information can involve a spoof website that appears to be eBay, but is designed to steal your personal information. Learn to recognize the signs of a spoofed website, and be cautious when entering account information into websites unless you've verified the URL. If you're a victim of information theft, take steps to secure your account. Follow the steps for securing your account on our help page, and if you suspect that you've become a victim of account theft, report it. Learn more about protecting yourself online on our help page. Read frequently asked questions about seller protection on eBay.